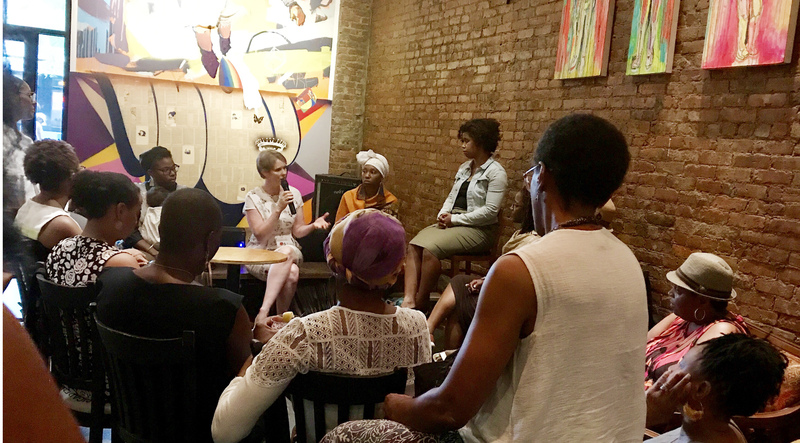 Candidate for New York State Governor Cynthia Nixon sits with Black women in Bedford Stuyvesant at Basquiat's Bottle on Fulton Street to discuss their issues. It’s not certain what Cynthia Nixon, candidate for Governor of New York State, expected for her first “State of NY Women” dialogue held last week in Bedford-Stuyvesant. What she got, in any event, was an audience with a multigenerational gathering of informed and discerning Black women – courteous but unafraid to speak their minds. It was a job interview in a relaxed setting and Nixon handled herself well. She revealed a refreshing knowledge of a wide range of issues on this first leg of what will be a series of visits she’ll make statewide to find out what concerns Black women wherever they live. Nixon’s campaign slogan reads: “A Progressive Fighter: Cynthia for NY.” Supporters tout her decade-long activism around issues affecting average New Yorkers. Education has long been chief among these. 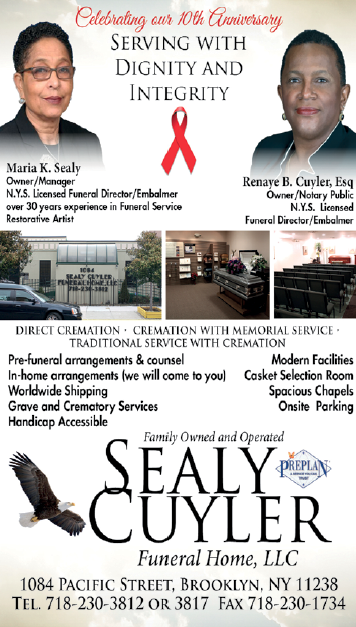 She was an early spokesperson for the Campaign for Fiscal Equity, addressing inequities in education in New York City when compared with other regions of the state. And as a member of Alliance for Quality Education, she organized with other public school parents and went to jail after protesting alongside Acorn founder Bertha Hope. A daily subway rider, Nixon got off the A train at Nostrand Avenue and walked up bustling Fulton Street. (She would later reveal a thorough grasp of the issues surrounding the dismal state of the MTA.) At Basquiat’s Bottle, a spacious bar, café and gathering space with walls displaying the work of local artists, L. Joy Williams, a senior advisor to Nixon’s campaign, joined Zinerman in presenting the candidate to those gathered. In response to a question about ending cash bail, Nixon addressed the injustice of the system but did not propose an alternative. “We have a system right now,” said the candidate, “where whether or not you’re held in jail has nothing to do with whether you’re a flight risk or a threat to the community at large, or to an individual. So in other words, if you’re dangerous, you can buy your way out. It seems to me that if you’re a threat, no amount of money should be able to have you out. What they’ve found in other states is people show up for trial because they plan to, whether there’s bail being held for them or not. It doesn’t actually make any difference. A question was asked about the IDC (Independent Democratic Conference). Nixon credits her campaign with putting a fire under Governor Andrew Cuomo on several issues and an April New York Times headline said, “Cynthia Nixon has already won by moving the governor to the Left.” The IDC certainly looks like a case in point. Cuomo’s momentum recently advanced dramatically in reclaiming rogue Democratic state senators voting with Republicans as part of the IDC. Cuomo claimed for years that there was just nothing to be done about it, a stance some judged to be a cynical attempt to court Republican favor. But in April, later on the same day that Nixon mentioned Stewart-Cousins’ exclusion by IDC members on the “Wendy Williams Show,” Cuomo magically resolved the issue which had been a major frustration for liberals. Nixon says she would not have stood for it. One woman’s pain was felt throughout the room as she very directly asked Nixon for a concrete answer to her question. “So sorry to hear that about your brother! It’s awful! It seems to me that one thing we need to do is change the nature of who sits on Parole Boards. And we need to change the point of view with which it’s determined who should be paroled. First of all, someone who’s gone to jail for that long, since that age, should never, unless they’ve committed the most heinous crime, should never be sitting in jail. “NYCHA has been underfunded by everybody: by the city, by the state, by the feds – for so long. I think it’s good that the city has agreed to put in a billion dollars, that’s a start. The governor has agreed to put in $250 million; that’s too little, too late, and we’ll see if he really comes up with it. One of the things that has been so wrong is when he actually gives a chunk of money, he doles it out in tiny little parcels so that it can’t be used for overarching needs like replacing roofs, fixing leaks, getting the mold out, getting the asbestos out and lead paint. Political consultant Stefani Zinerman, a co-founder of Woman-Up Brooklyn, curates State of NY Women. She’ll be doing the same for others going forward – organizing “intimate conversations” between candidates and the constituents they aim to serve. “Over the past election cycle, Black women have emerged as a crucial demographic for candidates seeking elected office,” says Zinerman. “My role in communities across New York State is to ensure that we get in the room and help set an agenda that meets our needs.” This candidate was game.